Thin and crispy sugar cookies usher in Halloween and one of my favorite holidays: Dia de los Muertos. I first learned about Dia de los Muertos while working at Chicago Children’s Museum in the early 90s. We had a traveling exhibit called Oaxaca that completely captivated me: the artisan crafts, the food, and the wonderful tradition of celebrating lost loved ones. While here in the U.S. Dia de los Muertos might seem ghoulish, I love the idea of remembering my lost loved ones, creating an altar to invite them back for a visit, and preparing some of their favorite foods. 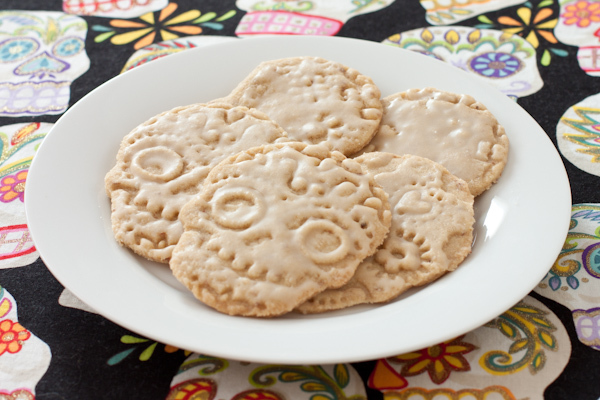 While researching the holiday for the exhibit, we learned that there were special skull cookies, called calaveras, that were popular during the holiday in Mexico. I was tasked with finding a bakery that would either share the recipe for calaveras or would make them for us. I spoke no Spanish and the only person in the office who was fluent happened to be Puerto Rican. They don’t celebrate Dia de los Muertos in Puerto Rico; it’s primarily a Mexican tradition. So, while Nancy spoke Spanish, she didn’t know the culture or the dialect involved. Nevertheless, she was gamely on the phone for me, calling the list of Mexican bakeries I’d found, asking if they made calaveras and whether they could share the recipe. After calling eight bakeries, we were getting nowhere. People either didn’t understand what we were asking for or my research was way off. Finally, one of our Mexican teen staffers came in and helped resolve the mystery. 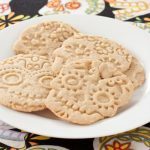 She explained, “If you called a bunch of regular bakeries and asked for their Christmas cookie recipe, would they know what you meant?” Everyone gives their own spin to calaveras, which are sugar cookies in a skull shape, or round cookies with skulls drawn on them in icing. With her help we ordered many dozen sugar cookies and a tub of icing. The cookie decorating class was a smashing success. The Husband surprised me by ordering these skull cookie cutters , so I whipped up a batch of my sugar cookie dough to give them a try. I think they look better unglazed, but they taste delicious either way. It’s a little tricky imprinting them without the dough sticking to the cutter. I used a lot of brown rice flour when rolling these out. 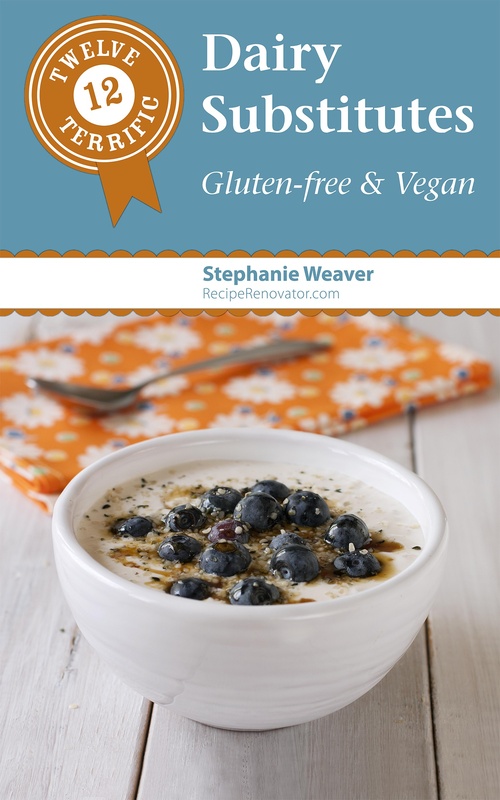 Add water to flax seeds in a small bowl and set aside. Cream butter and sugar in a large bowl until light and fluffy using a stand or hand mixer. Beat in gelled flax seeds and vanilla. Whisk together the sorghum flour, oat flour, almond meal, and salt in a medium bowl. Add flour to large mixing bowl, stirring just until blended. Chill or freeze the dough in four pieces, covered with plastic wrap. Keep dough cold while working with it, rolling out a little at a time. Use a lot of brown rice flour on your surface, rolling pin, hands, and cutters to keep the dough from sticking. Use a thin palette knife or metal spatula to move the cookies once cut. 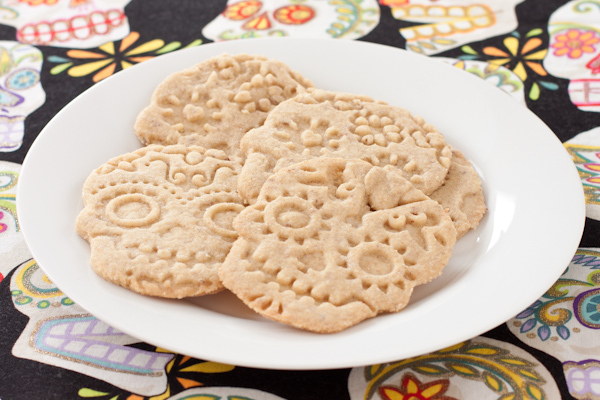 If using patterned cutters, dust the top of each cookie with more flour before pressing in the pattern. Bake on cold light-colored ungreased baking sheets, 2" apart, for 12-15 minutes. Let cool five minutes, then remove with a thin metal spatula to wire racks to cool completely. Glaze if desired. Store a days' worth of cookies on a plate, uncovered. Freeze additional cookies and thaw as needed. Or store the dough in the freezer and bake them fresh. Place the first three ingredients in your blender and blend until a fine powder. Use 1/4 C. of powdered sugar mixture in a separate bowl, add a few drops of rice milk or lemon juice at a time, stirring until it reaches a thin glaze consistency. Brush over cookies with a pastry brush. Glaze can be colored with natural food coloring if desired. I buy certified gluten-free oats from Bob's Red Mill and grind them myself in the Vitamix. If you cannot eat oats, I can't promise that another substitution will work in this recipe.